I have incredibly dry skin and I have suffered from ECZEMA all my life. I have pretty much tried everything I have come across, in the search to calm down my itchy skin. I think I have just about cracked it and found the combination of products to keep the eczema at bay. Yes from time to time I have flare ups but that is usually connected to stress or a change in temperature. 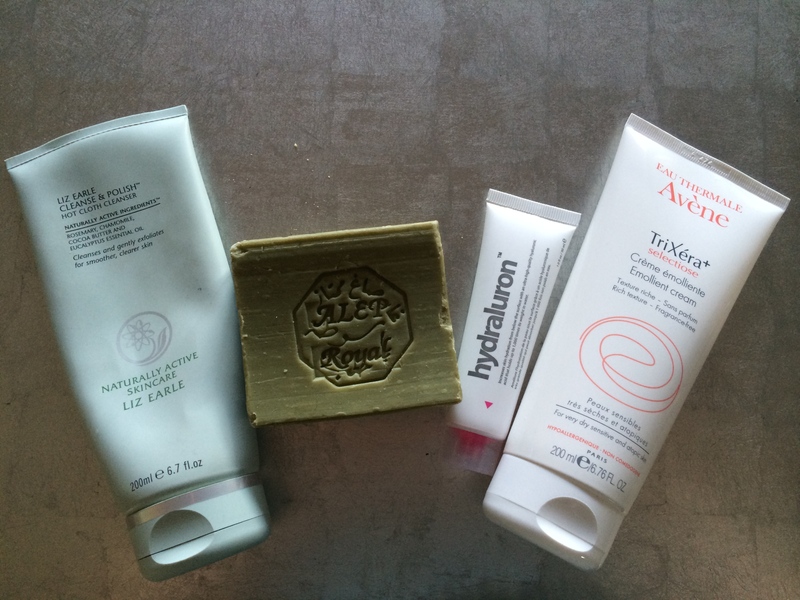 So here are my go to products that keep my skin hydrated and soothed. To remove my makeup I use the Liz Earle Cleanse and Polish Hot Cloth Cleanser. It’s gentle, removes all of my makeup and does not irritate my sensitive skin. I take a small amount of this and apply it straight on to my dry face and then work it into the skin. Here’s a tip: do your eyes last so that you don’t end up smearing your eye makeup all over your face! I then take a warm damp flannel and wipe it all off. TADAH! Makeup gone! Now this is the miracle eczema soap. I have used this for 15 years and swear by it to keep those rashes away. This is an all natural soap made from olive and laurel oil. Can you tell that I’m a sucker for natural products? That’s because I have used hydrocortisone steroid creams and whatever else the doctors threw at me for many years when I was younger. Not only are those creams pumped full of chemicals, they don’t do the job quite as well as my trusted Alep soap. It helps to clear any rashes I might have and I literally could not live without it. I use this to wash my face everyday. If I haven’t been wearing makeup I will skip the Liz Earle Cleanser and simply use this. You can get the Alep soap here. It is also stocked in a cute little shop open on Sundays in Columbia Road Flower Market called NOM. I started using Hydraluron about a year ago after the skincare queen Caroline Hirons was raving about it. It contains a pure form of hyaluronic acid, so helps to hold moisture. I apply this before my moisturiser to keep my skin feeling hydrated all day. I have used the Avene Trixera cream for 15 years. This and the Alep soap have survived the many products I have tried and have stayed in my daily skincare routine. It is nice and thick and very moisturising. I swear by this moisturiser and never leave home without a little pot of it in my handbag. I have also converted many of my friends to this who are now faithful users of this incredible moisturiser. So there you have it- my skin saviours! I am very jealous of your little hydraluron number. It is nearly impossible to get in the states and yet I hear EVERYONE raving about it. *sigh – Problems of international beauty bloggers… But if you think about it, the fact that we can be in contact with people all around the world who love beauty and their skin and share our same interests is truly amazing. I didn’t realise you can’t get it out there! Oh no! This really is a great way of sharing our interests and discovering new products. I’m definitely going to try the Avene cream, I need a richer moisturiser! I work in Wholefoods and have a discount but I have fairly dry and pink skin so I always go through moisturiser fast and a lot of the natural ones aren’t very rich. I normally mix rosehip oil into the moisturiers I’ve used from there which lengethens them, and my favourite that I’ve tried so far is the Weleda Iris Hydrating Day Creme, but at 30ml it’s just tiny! I normally buy it up when I go to Germany because it’s a German brand and so half the price. I’ve never tried Dr. Hauschka but that’s very popular in Germany and super expensive in the UK, I’d be interested to hear what you think of it ! Definitely try the Avene cream. I think that you will be pleasantly surprised! It might as natural as the moisturisers from whole food, but it is paraben free. I’ll have to look into Dr. Hauschka. I’ve heard good things about those products. I always go to whole goods to get the Balance Me lip balm. It is AMAZING!